Shanghai Port Internaitonal Cruise Terminal (Chinese:上海港国际客运中心), is a bubble-shaped glass building located on the Huangpu River in Hongkou District downtown Shanghai. 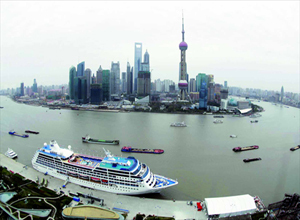 It is the largest passengers cruise terminal in Shanghai. Three mid-sized cruise ships between 70,000 tons and 80,000 tons are able to berth at the same time and the annual capacity of the terminal is one million passengers. It occupies an ideal position opposite the Lujiazui financial centre and is a few hundred meters from the Bund, enjoying a golden location, convenient transport links and an excellent connection to the surrounding tourist attractions.